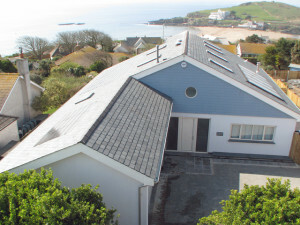 200 yards up from the magnificent sandy beach, Avocet is a huge, split-level, detached house, facing south with sensational panoramic views over the bay to Burgh Island and the coastline beyond. Enjoy this luxurious 6 bedroom self-catering accommodation, available for rental year-round on a weekly basis. With a stunning contemporary design, this seaside home is both stylish and superbly comfortable. It also uses cutting-edge eco-friendly technology, in order to leave the smallest of carbon footprints. Take advantage of a gorgeous coastal view, with big floor-to-ceiling windows on all three levels. A huge light-filled glossy white Kitchen/Dining room with granite worktops and a central island (ceramic hob), It includes the oven, combi-microwave, dishwasher, and fridge-freezer, as well as Nespresso coffee maker and food processor. Also a fully fitted Utility room with washing machine, tumble drier, and second freezer, larder fridge & dishwasher. The 12 seater dining area flows through to the fabulous Living room. Settle down on the large sofas and watch your favourite programmes and films on the 55″ OLED TV/DVD/Blu-ray/PVR…made even cosier in winter with a woodburner. Also on this level, large Games Room with Pool Table, TV, DVD, Wii and numerous board games. 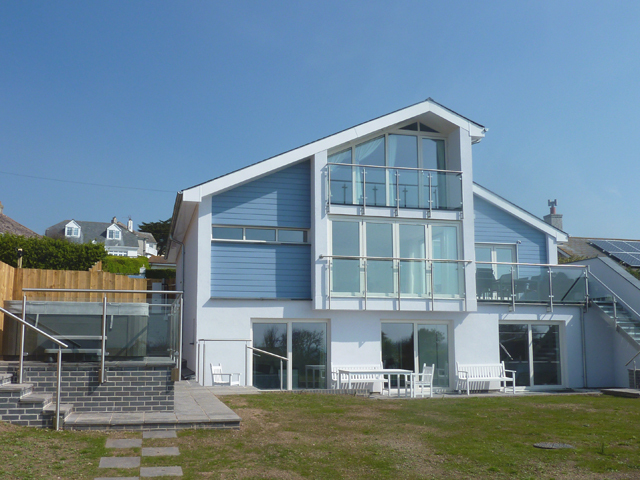 On the seaward side, a lovely garden with swing seat paved suntrap patio and elevated terrace both with barbecues. A large 6-person Hot Tub, perfect for lazy afternoons, or a relaxing evening with a fabulous sunset. From the hall, open tread oak stairs lead you up to the impressive Master double (6’ bed, TV/DVD) with walk-in dressing/cot room and large en suite bathroom (free standing bath plus separate walk-in rain shower and hand-shower attachment, twin washbasins, loo). The bedroom has panoramic views of the coast from floor-to-ceiling windows (door to small balcony). Stairs from the Hall lead down to enormous second Master Double (6’ bed, TV) with large en suite bathroom (bath, separate walk-in rain shower with hand-shower attachments, twin washbasins, loo). This bedroom has sea views with big sliding glazed doors to the garden. A stylish Twin (zip-linkable to 6’ double), with en suite bathroom (combined bath/rain shower with hand-shower attachments) also facing the sea with sliding glazed doors to the garden. A further very smart twin bedroom (zip-linkable to 6’ double) with en suite rain shower-room. Large bedroom has twin beds with en suite bathroom (combined bath/rain shower and hand-shower).